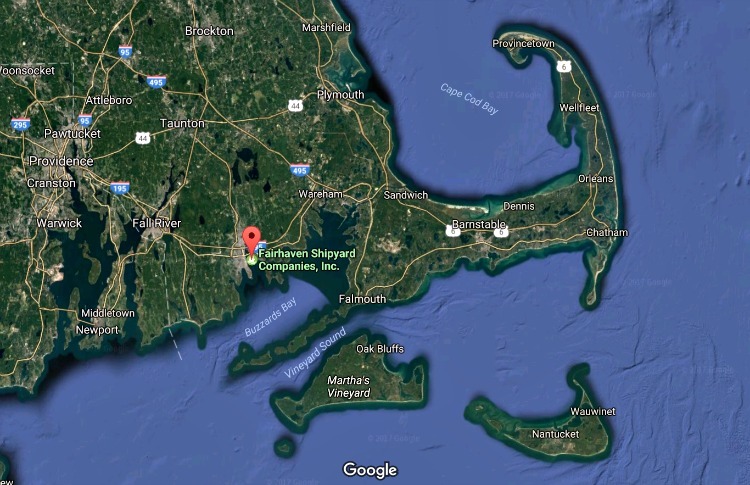 Fairhaven Shipyard Companies is located on Buzzards Bay, in Fairhaven, Massachusetts, which is in the harbor of the historic working port of New Bedford. Protected by a hurricane barrier, we provide safe, convenient dockage for all of our customers. In addition to transient or seasonal dockage, we offer a full-range of shipyard services. On property, we have our own machine shop, comprehensive paint facility, multi-brand engine shop with factory trained mechanics, electrical department, welding/metal fabrication department, service and parts, and travel-lifts to haul your vessel. We are also partnered with East Coast Boat Carpenters to meet any joinery needs. Furthermore, Fairhaven Shipyard has the capability to build your next new workboat. Our customers' vessels include some of the most sophisticated yachts and commercial boats in the world, along with classic wooden schooners and commercial fishing boats. This broad range gives us the experience and expertise to make our company well versed in handling all your boating needs. The South Yard, located on Fort Street, was originally developed by William Rotch Rodman in 1832, as a wharf and candle works. About a decade after his death in 1864, the property was sold to the American Nail Machine Company which utilized the property to manufacture tacks and nails for almost 40 years. When the company changed hands, it was moved, and the old tack works and wharf was sold at auction in 1903. For the next few years, until 1919 the buildings were used to manufacture shoes, then briefly housed an ice company and even acted as naval barracks for 400 servicemen during WWI. The property finally began its life as a shipyard in 1926, when Peirce and Kilbum took over. Although the name has changed, the premium location has remained a successful, working shipyard and marina ever since, meeting its current owners in December of 2005. The North Yard, located on Water Street encompasses "Old South Wharf", believed to be the first wharf built in Fairhaven. In 1864, Ahira Kelley relocated to Fairhaven and purchased "Old South Wharf" to begin a cod fishing business where cod was unloaded from family schooners, packaged and distributed all over the New Bedford Area. By the turn of the century, attention was shifted to the repair and storage of vessels. During the 1920's with the increasing popularity of hydroplane racing, the company decided to design and build their own model, the "Baby Whale" which was sold around the world until the onset of the Great Depression. During WWII, local boats were retrofitted into much needed minesweepers for the U.S. Navy, keeping the shipyard employed through the war. In the years to follow, the company expanded by acquiring more property, as well as engine dealerships. The ability to diversify the yard's focus over time allowed this family owned-and-operated company to flourish for 144 years and five generations of the Kelley family. In August of 2008, Fairhaven Shipyard & Marina Inc. purchased D.N. Kelley & Son, Inc. joining the two long standing shipyards became Fairhaven Shipyard Companies, Inc. The two yards working together provide a wider range of services, a larger team of skilled workers, and a great potential for growth. Since the union, Fairhaven Shipyard has acquired a new 440 ton travel lift, increasing the hauling capacity and has completed the construction of several fishing vessels, including Concordia. Going forward, the company strives to continue improvements and innovation and as always, endeavors to provide excellent quality service to all its customers. Copyright Fairhaven Shipyard Companies, Inc.